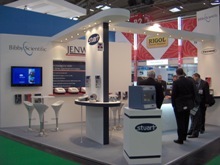 Bibby Scientific Launches New Products from Jenway, Stuart and Techne at Analytica! Analytica took place in March at the Munich Messe as usual. The Bibby Scientific stand was custom designed and built, and our largest to date at 36 metres square. Jenway showed the new 73 series spectrophotometers, there are four new units in the range which use icon driven software, this improves the navigation and makes the intruments extremely simple and intutitive to use. Overall, the show was a tremendous success with the new products being very well received. Please visit the brand websites for more information on Jenway, Stuart or Techne.